The liberal left-leaning Scandinavian nation Sweden could face a right-wing victory when results are announced tomorrow evening, which would be sending another electoral shock through Europe after nationalist parties brought victories in France, Italy, Hungary, Austria, The Netherlands and Germany in the past two years. Yes, the political fight of liberalism versus nationalism seems to be turning into nationalistic fervour in Europe, following the Brexit vote in the UK in 2016 and US President Donald Trump’s victory during the presidential runoff against Hillary Clinton. However, Sweden would truly be a scalping. 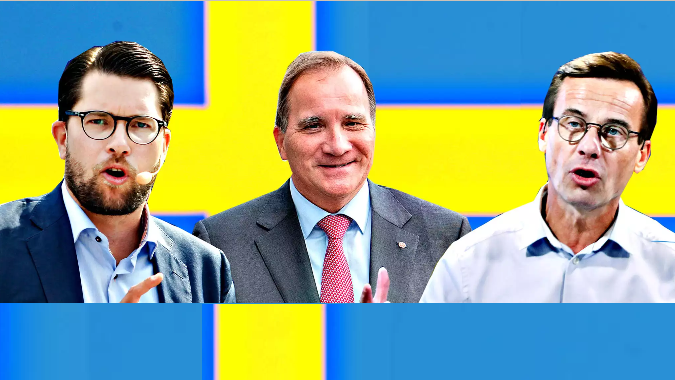 The blue-eyed blond Scandinavians have embraced left-leaning socialism since the 1960s, and the centre-left Social Democrats (their PM Mr Stefan Loven is pictured in the middle) have been in power for decades. Most recently, they have been ruling via a minority government together with the Green party. But Swedes have grown fearsome of the recent spate of crime and arsons that have gripped the country. The arrival of many migrants in 2015 brought with it a heightening of rapes and a strain on the social benefits system, or at least that’s how many Swedes experienced it. For this reason, many Scandinavians will be pinning their hope on the right-wing Sweden Democrats of Mr Jimmie Akesson (pictured left) who is both anti-immigrant and anti-Europe (although talk of a Swexit, or Sweden Exit seems premature). Related coverage: <a href="https://thegoldwater.com/news/36195-Sweden-Elections-Swedes-Are-White-And-The-Country-Is-Ours"> Sweden Elections - "Swedes Are White And The Country Is Ours”</a>. Mr Lofven seems to have lost the plot a bit, clearly unable to accept a pending defeat. On the last day of campaigning, he harshly warned the population of voting for the Sweden Democrats, claiming that a vote for them was "dangerous" and "counterproductive, like trying to quench fire with alcohol." With the many men and women working in state services dependant on the left remaining in power, his reaction is understandable, but nonetheless surprising. Meanwhile, the Sweden Democrats claimed yesterday that their leader, Mr Akesson, had received a letter (bearing the flag of the Islamic State militant group) threatening to behead him if he did not pull out of the election. Given that the left-wing parties have ruled out any coalition with the Sweden Democrats, whom they view as far-right, the possible final victory will most likely be for the conservative Moderate Party, headed by Mr Ulf Kristersson (pictured right). If the polls ring true, Mr Kristersson will be the kingmaker. Able to rule with either the left (although he would not be guaranteed the PM position), leaving the Sweden Democrats to win even bigger if he doesn’t tackle the crime issue by the next election, or, like in Austria, rule with the right-wing Sweden Democrats (who will likely hand him the premiership for a chance to rule) and end Sweden’s immigration program. A leftist liberal tyrant saying the opposition is dangerous. Good joke.